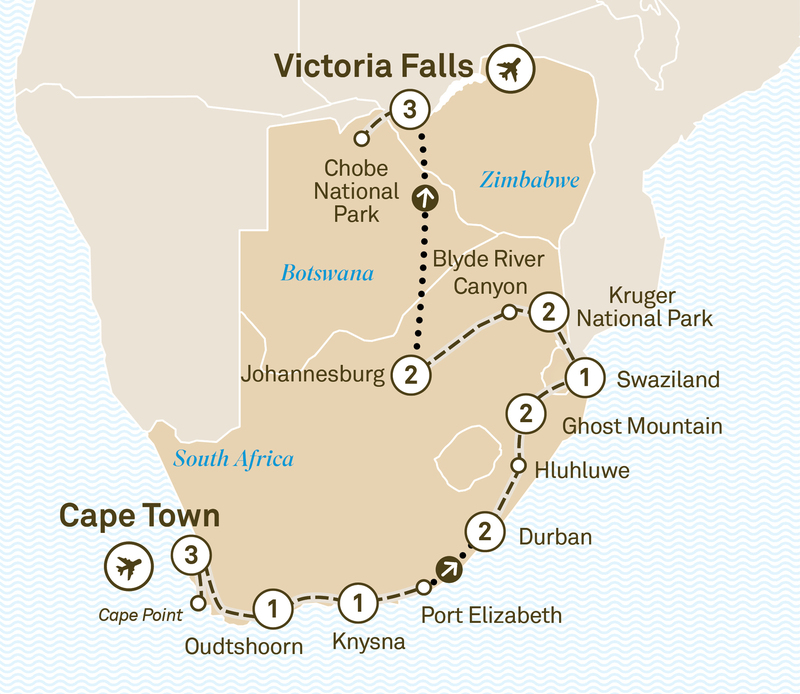 From Cape Point to the incomparable Victoria Falls, embark on an amazing 18 day luxury journey. Discover South Africa's Garden Route, Knysna & Oudstshoorn. Africa’s southern region is in many ways unlike any to the north. The cultures, landscapes and histories that encompass this intriguing sub-continent have given it an identity and mystique that is all its own. From Cape Point, right at the southern tip, all the way to the incomparable Victoria Falls, the attractions on this itinerary provide a perspective certain to satisfy your curiosity about this intriguing land. You’ll have the opportunity to discover if South Africa’s Garden Route truly is as beautiful as legend paints it. You’ll stop off at pristine Knysna, and unique Oudtshoorn. You’ll see the hills of Natal, just as they might have been when Shaka Zulu reigned supreme. And you’ll get to visit some of the region’s great national parks and game lodges. Say farewell to new-found friends and the wonders of Africa as you depart from Victoria Falls airport after breakfast this morning. Please book flights to depart after midday. Starting in Johannesburg, visit the mighty Victoria Falls, Chobe National Park, Nairobi, Lake Nakuru, Masai Mara Reserve & more on a 19 day luxury journey.